My secret nefarious inky plan revealed! Last month, I hinted that I have a secret. The time has come to reveal it. First, the punch line: I’m getting a tattoo. Second, one step back: it’s because of you, me droogs. A few months ago, when I had newly joined the Hive Overmind Discover Magazine, Top Banana (OK, he’s the CEO) Henry Donahue and I were talking about how the move should increase traffic for my blog and increase Discover Mag’s online presence. We were joking around about how popular Carl Zimmer’s Science Tattoo Emporium is, and how much traffic the site overall had. One reason I joined the Overmind was to help broaden my reach, so we started brainstorming. And as we talked, somehow we decided that Henry and I would both get tattoos if in the period of one calendar month I got 2 million page views to my blog, and the site overall got 5 million, and, moreover, I would take suggestions from my readers on my tat. No alcohol was involved in that conversation, I’ll note. I almost wish there had been. At least I’d have an excuse. So, remember last month how I mercilessly and relentlessly asked folks to follow me on Twitter, and to send my posts to social networks like Fark, Digg, Reddit, and Slashdot? Yeah, that was all part of the nefarious plan, all to reach that goal. That’s right: thanks to all of you, I made it! In fact, that picture was grabbed before the end of the day; I broke the goal by about 50,000 page views. And it really was on that last day when it went through 2M, so it was something of a nail-biter. And if you think I am not going to go through with this, I kinda have to. Discover Magazine made a press release for it. So now, well, I’m stuck. 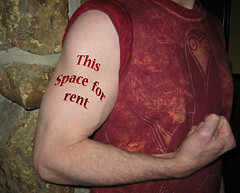 I have to get a tattoo. I have some ideas, but since you all are the ones who propelled me through my arbitrary goal, I’ll ask you: what should I get? Assume I’ll get the tattoo on my upper right arm, just below the shoulder, and it’ll be maybe 2×3 inches or so. I want it to be safe for work, not too elaborate, something sciencey, but something that is special. You know I write what I think here, so if you read my stuff, you’ll have an idea of what I might like. Mind you, I’m not saying I’ll go with whatever someone comes up with! For example: "Colbert" = no. I’m looking for ideas here; it doesn’t have to be fully-formed and perfect, but can be something I can use as a jumping-off place to think about ink. And may I say to everyone who helped without knowing why: thanks. It was very cool that y’all trusted me. 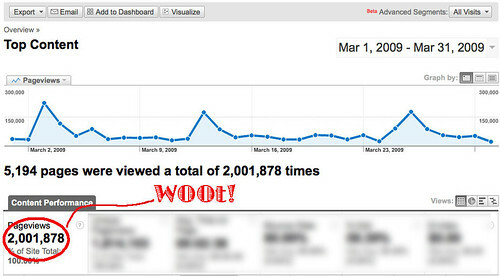 And it was way fun watching the counter go up every day, and to see it hit 2M was very, very gratifying.